I have a 10X10 outside dog kennel for sale. $250.00. (205) 485- 3004. Alli Temple Honored Friday Night! 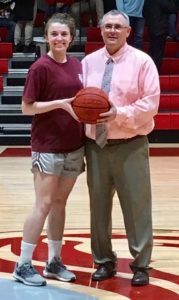 Alli Temple was honored Friday night for having scored 1000 points in her high school basketball career. And she is only a Junior! She accomplished this feat at the January 8 home game against Curry in which she scored 20 points and led the Lady Lions to a 50-31 area victory. She is one of 7 Juniors who play for the Lions. She was recognized as being outstanding in the classroom as well as on the basketball court. She is also a leader on the volleyball court and in track field. Before Friday night, her career point total stood at 1,068. Her parents are Al and Stacie Temple. The Haleyville Lions Lady Lions defeated the Fayette Lady Tigers Friday night 60-53. The Varsity Boys defeated Fayette 59-41. Both teams will play Carbon Hill at Carbon Hill Monday, and back home on Tuesday against Lamar County.